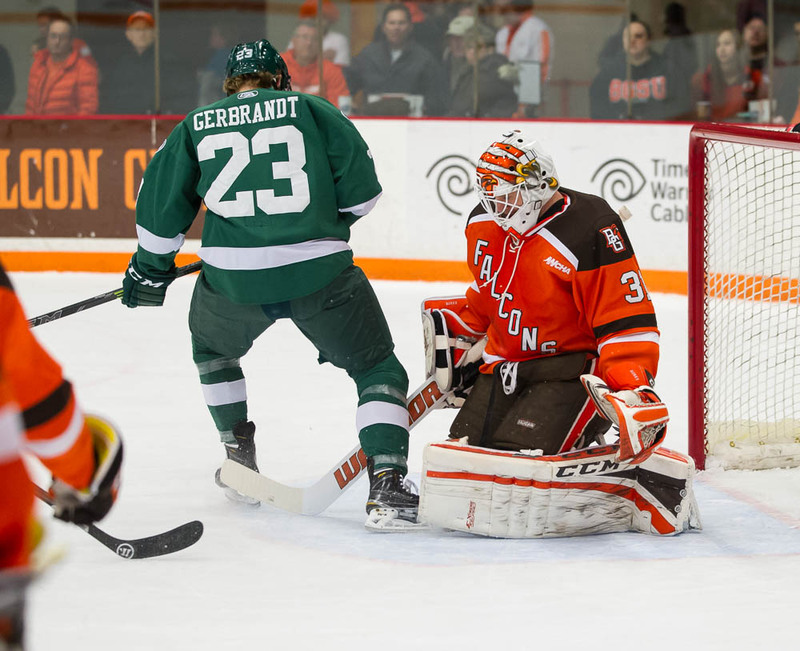 The BG hockey team keeps seemingly passing all tests thrown its way, and is heading into the unofficial “second half” of the season on a strong note. I say unofficial because, at only 16 games played, the Falcons haven’t quite hit the halfway mark yet, despite them being on hiatus until 2015. That loaded second-half schedule will be interesting to see. It features only two weekends sets against ranked teams (No. 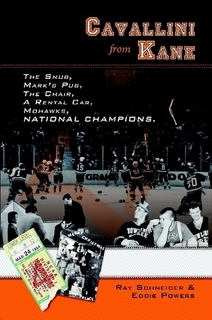 4 Michigan Tech on Jan. 16-17 and No. 17 Robert Morris Jan. 3-4). But BG will play every weekend from Jan. 3 to, at least, March 13-15, the first round of the WCHA playoffs. That stretch features long road trips to Houghton, Mich., and Bemidji, Minn., plus another plane flight to Alaska. But, in the good news department, BG doesn’t play back-to-back road weekends for the rest of the year. At 11-3-2 and No. 13 in the country, it’s kind of hard to say anything but BG has been playing strong all year. But it’s been very strong of late. Since losing 5-2 to Minnesota State on Halloween, BG is 7-1-1. And it’s come against teams that aren’t really that bad. The question becomes, “can BG keep this up during a long layoff from games?” We’ll find out. Greiner: Freshman forward Ben Greiner hasn’t played much this year. He sort of got lost in the forward shuffle early in the year, and when he got a chance to play against Bemidji State a few weeks ago, a girth of penalties kept him glued to the bench. In the “first half” Greiner has played only five games. But he made the most of his time this weekend, scoring twice in Friday’s 5-5 tie with Northern Michigan. At 6-foot, 193 pounds he’s not a hulking individual, but he’s certainly big enough to be a force down low, and his net presence was strong Friday. Human: As it turns out Northern Michigan goalie Mathias Dalhstrom isn’t Martian or Plutonian or anything like that. Yeah he’s been sort of trending down the last few weeks, but he was still first nationally in goals-against average and second in save percent, so it wasn’t like he was in the middle of a free fall. Well, I guess now you could argue he kind of is. Was this weekend just him having a bad couple games, or was it BG that badly exploiting Northern’s defense. A little bit of both, maybe? I’ll leave you to be the judge of that. Regardless, BG scored 10 times on 61 shots this weekend. You’d expect an elite goalie to not surrender back-to-back five-goal performances, but I digress. Secondary: That’s all I’ll talk about Dahlstrom. We’re not observing him, after all. Let’s look at the guys who did the damage for BG. You’ll notice something: it’s still not the top dogs. Dan DeSalvo and Brent Tate were pointless, Kevin Dufour had an assist and Adam Berkle had a goal. But other than that it was the secondary guys again. The one exception to that would be Ben Murphy, who scored twice and was a guy you’d figure the staff was hoping to take another step forward this year. Saturday’s performance was a good start. Matt Pohlkamp had three assists, Greiner scored twice, Brandon Hawkins scored twice, Mitchell McLain had two assists, Pierre-Luc Mercier had two goals and two assists. That’s a lot of guys getting in on the action and making real contributions. Just look at the stats for the season. Pohlkamp leads the team with a very respectable 13 points in 16 games, and Mercier and Dufour each have 12 points. But no one on this team is really blowing you away with their production. Depending on how you feel a hockey team should be structured, that’s either a good thing or a bad thing. Well I like balance so I’m saying it’s a good thing. To have this many guys producing (plus the looming specter of DeSalvo, Berkle and Tate capable of going off at any time) it make things difficult on opposing defenses. Who do you focus on shutting down? When you can roll three or four lines and trust them to produce in all situations and not get run over, it keeps you fresh throughout the game. Then maybe the other team is in a situation where they’re only rolling two or three lines. Those guys get tired, which opens things up later in games. It’s a whole chain reaction type thing. Nell: We’ll finish off the last morning observations of 2014 with the guy who I think has been the biggest surprise on the team this year: Chris Nell. Heading into the season, if you really weren’t paying too much attention, you’d probably have assumed that Nell was coming in to be that No. 3 goalie who dresses for home games and is just there for practice. I won’t lie, at first that’s kind of what I assumed too. At best, you can argue Nell has been BG’s best goalie this year. He’s posted both of BG’s shutouts this year, and aside from allowing four goals to Clarkson in a game that the defense around him kind of lost its intensity, he hasn’t allowed more than two goals (four out of five starts). He’s posted a 1.60 goals-against average and a .945 save percent, numbers that would be second and first, respectively, in the WCHA had he played enough minutes to qualify. Your guess for the goaltending in the second half is as good as mine. Will Sholl work his way back into rotation? Will Nell and Burke continue to split, or will one take firm control of the crease? One this is for sure: if BG keeps winning at this pace and a potential at-large bid for the NCAA Tournament becomes a realistic possibility, you can bet Bergeron rides whoever gives them the best chance at winning. If that happens to be Chris Nell, so be it.